The theme for Arab Xpressions this year was “ajyal” which means generations in Arabic. This theme was represented well in the show presented by the Arab Student Association and wider Arab community. While last year’s show was very outwardly political, this show was more subtle and nuanced. From the fashion show to the five dabke troupes we were shown the progression of Arab culture as something that is vibrant and alive, not stagnant. The fashion show was a magnificent representation of this range with some eighty Arab students displaying both old fashioned and modern representations of Arab fashion, from traditional thobes to artfully draped kuffiyehs. The dabke dance troupes showed a similar progression with more traditional dance and costumes to the more modern representations. 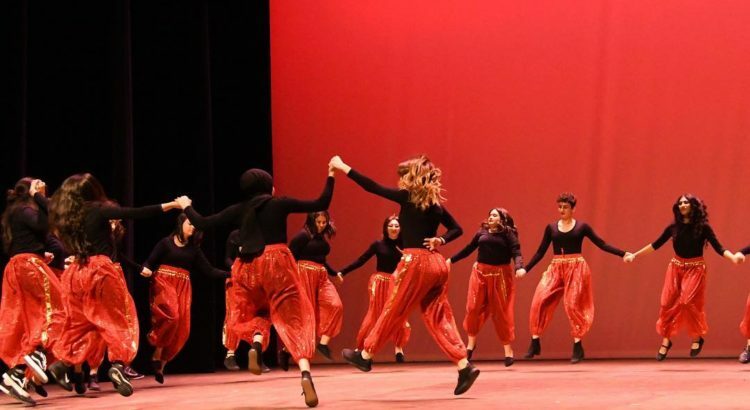 A friend of mine danced with one of the co-ed troupes representing modern dabke, dancing in track suits to songs by popular artists like Nancy Ajram; I caught up with her to see what the experience was like for student performers. Maya Chamra is a sophomore in LSA who identifies as Lebanese and Syrian. We talked a little bit about what it meant for her to be performing at Arab Xpressions with a crowd full of friends and family. Maya expressed how special it was for her to connect with a dance so important to her culture and the pride she felt. After watching the show last year from the audience, Maya felt the the need to be more involved with the Arab community on campus so she joined her dabke troupe this last October and had been practicing ever since. One aspect of Arab Xpressions that Maya and I discussed is its role in uniting the Arab community on campus. Maya herself is not particularly active in the larger Arab Student Union but connects with her community through dabke. She perceived this to be a common occurrence for many of her fellow Arab-identifying students participating in the show. Arab Xpressions is always a wonderful way for the University to come together and show support for the Arab student community. The night is always full of laughter, cheers, and often a few tears and Arab Xpressions 2019 was no exception. Image courtesy of the Arab Xpressions Facebook event page. I liked the theme since I imagine a lot of students are second or third generation immigrants. WishI had gone to see the show.